Those who have been following this blog and @realitycheckind on Twitter will be familiar with my strident opposition to the Right to Education Act. Getting your child into a school of your wish and means is about as basic a human need as food and water, yet our state has sunk us. This elementary need is defeated not in some remote jungle, but in the nations capital. I’ve blogged about the Delhi nursery admissions issue last year and this year too. Continuing from where we left off in January, there was a flurry of litigation by Private Non-Minority schools, which did not move the Delhi High Court nor the Supreme Court. Following the legal cul-de-sac, private non-minority schools diligently conducted lotteries using the rules announced by the govt. Schools conducted anywhere from 3 to 6 lotteries in the following manner. A quick refresher of the points system. If you are from the neighborhood defined by a 8kms radius, you get 70 points, 5 points for alumni, 20 pts for having a sibling in the same school, 5 points for out of state transfers. Also note that EWS (income) / DG (caste) candidates can apply in the cross subsidized 25% quota as well as the open seats. In addition girls can apply in the 5% girls quota as well as the open seats. On Feb 27, after the lotteries were conducted under mandated video surveillance, it turned out that a disproportionate number of winners had emerged from the transfer points category. This was challenged again, which led to the Delhi govt getting a notice from the Delhi HC. The Delhi Govt (Mr Najeeb Jung) promptly scrapped the admissions of those who won the lotteries by claiming the 5% inter-state transfer points. Since private schools run by Hindus have completely lost their autonomy to select even a single student – the debate shifts to the mechanics of the lottery. This is not an obsession with detail, but rather the central issue. After all, if the system prescribed by law turns out to be arbitrary, the schools are forced to participate in an immoral scheme against their will. Not very far from tyranny. Post cancellation of all winners with the 5% transfer points; the situation looks like this. Those schools who only conducted three lotteries. All seats are taken by EWS+DG/Siblings+Alumni – so there is no impact because the 75 transfer pointers never had a chance to begin with. Those schools only conducted four lotteries. Same thing, All open seats taken by Siblings at 90 points. So transfer pointers at 75 never had a chance. Those schools who conducted five and six lotteries – there is an impact. See below. The very fact that they held five lotteries means they had vacant seats for 75-pointers after ALL the siblings and the alumni+siblings were granted admission. Now if the 75-pointers with transfer points are ejected, what happens ? If there are enough alumni 75-pointers, they will simply occupy the seats vacated by the transfer pointers. If after all alumni are accommodated, there are seats left, the transferees join the general category (70 pointers) in a NEW 6th lottery. In both these cases, there is no difference in the odds of the transfer pointees. Only the vacated seats by transferees,are now subject to a fresh lottery for leftovers at 70-points. The transferees join the losers of the earlier lottery this time to bid for a much smaller fraction of seats. For the earlier losers at 70-points, this is the second lottery, but for the transferees this is the first. So the relative odds odds of transferees are 1:2 compared to a system where they didnt have transfer points at all. The use of waiting lists further complicates the matter. The waiting list from the previous lottery are also winners in the sense that any vacancy has to absorb them. Therefore cancelling the waiting list winners and forcing partial redraw is sure to send them to court next. This per se is a highly immoral quota because it imposes by law a 52.5% 47.5% Girl:Boy ratio in RTE “enabled” schools while on the ground the demographics do not match.But lets set that aside for now. 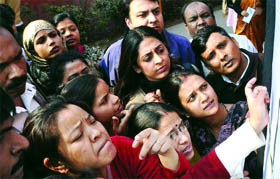 Now, if a transfer point girl has got admission in the general quota, then her admission now stands cancelled. It is not clear if the girls lottery included all girls, including winners. If not, the transfer girls who won in general 75-point draw have a very strong case to move court again. This is what happens down the road when arbitrary laws are not judicially checked up front. It does the Honorable Delhi HC no good if, after approving the points system it turns around asks justifications on an ad-hoc basis for certain points. An equally valid question is : What is the justification for alumni points? Why have 20 and not 5 points for siblings ? Why have 70 points for neighborhood? Why 70 ? why not 40, 50, 60. The truth is none of these are justified if the transfer points are not justified. The 5% alumni points is now snarkily called “dynasty points”? Two siblings today will spawn into four in one generation. You are locking down, by law, non-minority schools into families. I’d say the transfer points is a far more defensible scheme than this ludicrous system. Those transferred to Delhi from other states rarely do it out of love for Lutyens. They are also unlikely to have the other points. In the new system, they have to pick their rental house first and then apply for schools. This is the reverse of what normally happens, they first get a school admission, then look for a rental place. Does that mean they should get a 5% head up over long time Delhi residents? Not at all. As I said, the whole system is arbitrary. How many of you even know what you need to know about the 25% quota. What if I told you 30-40% are taken by non -poor under the Disadvantaged Group category which includes SC/ST (no income limit) and OBC (non creamy layer 4.5Lakh)? If you are going to crucify hapless 5% transfer pointees, should you not subject all the rules to a sweeping scrutiny? What we have on our hands is a group that is wronged. Based on a govt announced points program, one which they never asked for, they applied with 75 points. To now go back and strip the winners reeks of unconstitutionality. Was this category misused by Noida folks? The right way is to pin the blame on those who allowed such an invasive law to be passed without even this level of thought. I have been saying this for a while on Twitter. A society based on Rule of Law is distinguished by the state exercising its coercion powers based on principles of generality, predictability, and non-retroactivity. All three are absent from the our recent education laws. In a society based on arbitrariness and adhocism the rulers private prejudices and preferences leak their way into rules for the general public. What if the use of arbitrariness is itself not uniform? Carefully placed arbitrary laws in one domain and tight and very specific laws especially the punitive portions in another domain is one of the essential elements of tyranny. In an Idea of India state, where sectarian laws are used as a tool of accommodation, we have to be extra alert. We have to focus not just on how these laws are institutionalized but rather on whether the arbitrariness itself has a hidden form. What appears arbitrary on the surface, could serve to turn the exemption from these very laws into a private good to be distributed to certain inside groups.